snowdeal.org > ex machina: I-90 mutilated acres. or how to hold a grudge for a really long time. 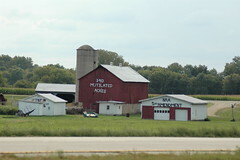 I-90 mutilated acres. or how to hold a grudge for a really long time. this farmer just east of madison wisconsin leaves no doubt where he stands on the building of the highway through his farm just east of the US-12/US-18 interchange - a strech of highway that was completed in 1961. and, just in case you had any doubts, he's a big fan of the second amendment.